Chances are, your annual fall pilgrimage to pick apples results in lugging home a lot more fruit than you can eat in just a few days. Or perhaps you just get overly excited when faced with a grocery store sale. Either way, at some point, you’ll probably have far too many apples in your kitchen just waiting to go bad. One key to keeping them fresh until you can eat them? Humidity, according to Food & Wine. There’s a reason that grocery store produce shelves are misted with water regularly throughout the day. The extra moisture can keep fruits and vegetables fresh, reducing the amount of rotten food that has to be thrown out. The humid air keeps the produce from losing water, preventing shrinkage. 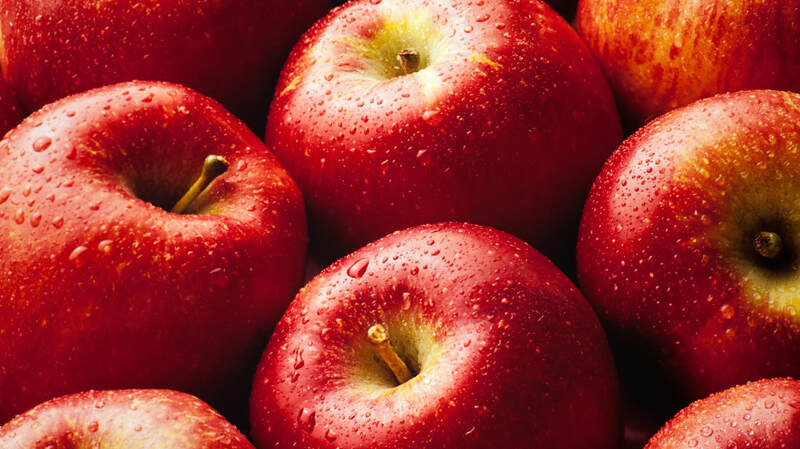 Apples are one of those fruits that can benefit from high humidity. The ideal storage environment for apples involves a temperature of between 30°F and 35°F and relative humidity of 90 to 95 percent. If you don’t have a cold, damp cellar on hand to keep your apples moist, stick them in the fridge wrapped in a damp paper towel. You can also leave them in a plastic bag, but make sure to poke a few holes in it to let out the ethylene gas that apples give off as they ripen. If you can, keep your apples in a crisper drawer in the fridge, since that will stay more humid than the rest of your fridge. Just be careful not to store them with other produce that's sensitive to ethylene gas—like strawberries—since the gas given off by the apples will cause that other produce to rot faster. If you’re at a grocery store, chances are you’re buying apples that have already stayed fresh for a long time. Controlled-atmosphere storage—keeping fruit at tightly controlled temperatures and oxygen and humidity levels—can keep apples tasting fresh for months, even up to a year after harvesting. That’s why you can enjoy apples year-round, though they’re largely harvested between July and October. In the future, apples might be able to last even longer. One day, we might have an edible coating that can keep them fresh, like Apeel, a produce-preservation coating that has been developed for avocados.